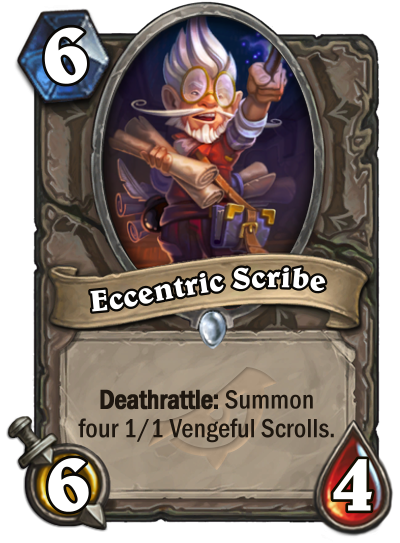 The scrolls sound like no tribe cards, seems like a lot of mana for this card I feel like this is an average arena card, good in miniature warfares cause in the future. It's a similar amount of stats and effect to Cairne Bloodhoof, but the initial body is much more threatening, and it has more synergy in a token based deck. It is weaker to AoE, however it should still be good enough against AoE most of the time due to being a deathrattle. Overall it's a fairly average card that might see some play. Very strong in arena, nothing more. A smaller Violet Wyrm. And, like Violet Wyrm, it'll be good in Arena and terrible in Constructed. 10/8 of delayed stats for 6. Prolly not good, but arena will take it. Arena card primarily but not bad if you get it randomly either. I wish this cool art and flavour were deployed for a better card. Slightly worse than Piloted Sky Golem. But really Team5 should stop printing deathrattle tokens it is very annoying. So Jepetto Joybuzz got another target. So many to choose from. Some people in Team5 really likes Miniature Warfare. Only slightly because Highmane is basically a legendary minion disguised as a rare. so... i say it's good. What are the scrolls ? Only 1/1 minions without tribe ? Where can we see them ? This looks quite strong in arena. Compare to Savannah Highmane. You know what? I take back what I said this card seem really good it's just slightly worse than highmane and it summons a big board after it dies! so.. token decks might play it.. druid? Piloted Sky Golem didn't see much play and it was far better than this card. The decks where the Deathrattle would be relevant are not decks where I want to run a 6-mana 6/4 however.